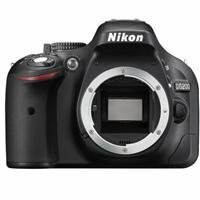 Nikon D5200 is a great entry-level DSLR camera which comes packed with impressive specs. It was unveiled in the US at the annual Consumer Electronics Show held in Las Vegas. It comes with megapixels upgraded from 16.2 of its predecessors to 24.1megapixels. The Nikon D5200’s 5fps continuous shooting is no match for Nikon D5100’s 4fps speed. Like any other beginner DSLR, the Nikon D5200 has no Focus Motor. Its autofocus is limited to AF-S or AF-I CPU. It has a slightly bigger body than the Nikon D5200 though 2 ounces lighter. This entry-level DSLR supports memory media including SD/SDHC/SDXC. Nikon has made it possible to use cards from SanDisk Panasonic and Lexar on the Nikon D5200. Like regular DSLRs, the Nikon D5200 comes with a pronounced handgrip on its right side. It is topped with an elongated casing to accommodate the Nikon D5200’s inbuilt flash. It also houses the eye-level pentamirror viewfinder. It’s one of the smallest DSLR beginners’ cameras measuring 5.9 x 3.9 x 3.1 inches. The information edit on this entry-level DSLR is its primary tool. It makes adjustments on the fly. It has settings for image quality and size, white balance, ISO, picture control among others. Whichever setting you chose depends on the shooting mode. Nikon D5200 has a handgrip laced with a rubber material. It gives a firmer grip. There is also a good balance for your fingers and the right hand between the grip and the lens base. The menu on the Nikon D5200 is what you would expect from an entry-level DSLR. It has one-page playback menu, flash and control functions among others. How to go about the menu is not a daunting task even for beginner DSLR users. It is because of Nikon D5200’s help button. It is handy in case a camera function stumps you in the field. This best DSLR for beginners has a 3 inch LCD with 921,000 dot composition. It has the ability to be adjusted to a maximum of seven levels of brightness. The screen on the Nikon D200 can be rotated through 180˚ of travel. It is useful when doing image review under bright conditions. The present image quality for Nikon D5200 is quite pleasing for color fidelity. Users who prefer shooting in P, A, S, or M modes can reset picture control on the shooting menu. It will increase the in-camera sharpening for JPEG images on this DSLR for beginners. You can use any of the six palette color choices when setting picture control. The Nikon D5200 is a solid performer that delivers excellent image quality and impressive high-ISO performance, along with an articulated screen and a control interface that's appropriate for users stepping up to a DSLR.